Definition at line 46 of file chainiksolvervel_pinv_nso.hpp. Definition at line 27 of file chainiksolvervel_pinv_nso.cpp. Definition at line 47 of file chainiksolvervel_pinv_nso.cpp. 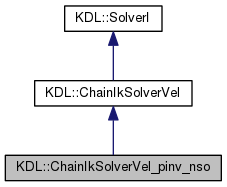 Definition at line 79 of file chainiksolvervel_pinv_nso.cpp. Calculate inverse velocity kinematics, from joint positions and cartesian velocity to joint velocities. Definition at line 84 of file chainiksolvervel_pinv_nso.cpp. Definition at line 72 of file chainiksolvervel_pinv_nso.hpp. Definition at line 102 of file chainiksolvervel_pinv_nso.hpp. Definition at line 91 of file chainiksolvervel_pinv_nso.hpp. Definition at line 135 of file chainiksolvervel_pinv_nso.hpp. Definition at line 80 of file chainiksolvervel_pinv_nso.hpp. Definition at line 182 of file chainiksolvervel_pinv_nso.cpp. Definition at line 174 of file chainiksolvervel_pinv_nso.cpp. Definition at line 166 of file chainiksolvervel_pinv_nso.cpp. Definition at line 65 of file chainiksolvervel_pinv_nso.cpp. Definition at line 154 of file chainiksolvervel_pinv_nso.hpp. Definition at line 141 of file chainiksolvervel_pinv_nso.hpp. Definition at line 151 of file chainiksolvervel_pinv_nso.hpp. Definition at line 144 of file chainiksolvervel_pinv_nso.hpp. Definition at line 142 of file chainiksolvervel_pinv_nso.hpp. Definition at line 152 of file chainiksolvervel_pinv_nso.hpp. Definition at line 143 of file chainiksolvervel_pinv_nso.hpp. Definition at line 156 of file chainiksolvervel_pinv_nso.hpp. Definition at line 146 of file chainiksolvervel_pinv_nso.hpp. Definition at line 147 of file chainiksolvervel_pinv_nso.hpp. Definition at line 153 of file chainiksolvervel_pinv_nso.hpp. Definition at line 149 of file chainiksolvervel_pinv_nso.hpp. Definition at line 150 of file chainiksolvervel_pinv_nso.hpp. Definition at line 145 of file chainiksolvervel_pinv_nso.hpp. Definition at line 148 of file chainiksolvervel_pinv_nso.hpp. Definition at line 155 of file chainiksolvervel_pinv_nso.hpp.